Unfortunatley, this avocado died about 5 years after being planted. I attribute its demise to its proximity to a large pinetree. While the pine tree provided shade it also competed with the avocado for nutrients and water. After 3 years of very healthy growth, the avocado tree's growth first slowed considerably and then it started to look pale. I had great success with some of my other plants giving them magnesium sulfate so I tried an application with this tree and it burned it terribly. After that the tree slowly perished over 2 years. It would die back periodically then try to recover but not to its former size before dying back again. Slowly it became nothing but a stump and then grew no more. Without a doubt the Winter Mexican variety did better here than any other I have tried. The next best variety is a Mexicola from Home Depot which surely came from California. I still have this Mexicola in the shade and it never really grows but has been a small half dead shrub for years. Regardless, it has been alive for 7 years and I don't even pay attention to it! Advocado's are extremely challenging to grow here. There are a couple of big trees around the Phoenix area, and I have seen them. However, I have never tasted a good tasting fruit from one. I have tasted some bad tasting fruits from some friends' trees, but never a good one. The bad tasting ones tasted like they were fermented which I think is what you can expect if a fruit ripens here when it's really hot out. I think you definitely want a Winter ripening variety here. One of the most remarkable trees in Arizona is one on a ranch in Aravaipa Canyon. Here is a link to video about it Aravaipa Canyon Avocado. It appears to have been a lucky seedling. Aravaipa Canyon is 10 F. degrees cooler then Phoenix, because it is higher altitude, so it is not exactly the same climate as here. I have not had the fruit from this one either. Here is a link to a video about a tree growing in Mesa Arizona Mesa Arizona Avocado. I'm fairly tempted to try a Winter Mexican in a better spot in my yard again one day. Funny thing is that I'm not a big avocado lover, but my wife is, ha ha. The avocado tree on the right was photographed in March of 2009, which is about 1.5 years after it was planted in October of 2007. It is planted on the north side of a wall and the east side of a large pine tree. The pine tree almost overhangs the avocado, so it gets morning sun and afternoon shade. 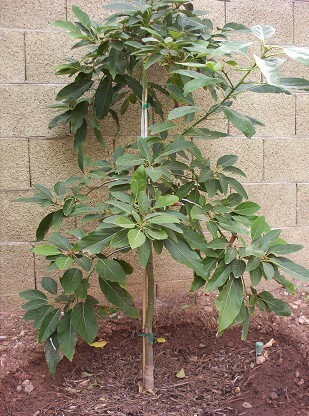 This avocado tree is a variety named Winter Mexican, a Mexican x West Indian hybrid, and was mail ordered from Florida. It is doing really well so far and has almost doubled in size to 6 feet tall. It has flowered once but has not set any fruit. This plant has also tolerated 115 F. in the middle of summer without problems, and there should be no worries of this variety being damaged in the winter because it is reportedly hardy to 22 F. This avocado tree shows no signs of salt burn which is quite amazing considering my experience with other avocado trees. Previously, I attempted to grow two avocados trees from California and they both died. All the avocado trees available in local stores are from California. middle of summer, even though it was in full shade. The Haas shriveled up like a piece of lettuce in the sun when temperatures went over 115 degrees Fahrenheit. It just couldn't take the heat. My second California avocado attempt was a variety called Zutano. It took the heat better than the Haas and faired well in the winter even when temperatures went down to 26 F., which is very unusual weather for the Phoenix metro area. However, the Zutano slowly racked up salt burn damage which eventually finished it off. It lasted about 2.5 years, and didn't grow much if at all. Florida avocado trees might do better here in Arizona than the California grown plants because they are grown on more salt resistent rootstock such as Lula and Waldin, where as the California variety rootstocks are more resistant to root rot, but salt sensitive. Avocado trees seem to be the gardening urban legend of Phoenix. Supposedly there are large mature avocados somewhere in the Phoenix area, producing bushels of wonderful fruit, and when the moon is full there are fairies and leprechauns playing in the branches. Okay, I made that last part up, but I have yet to see a large avocado tree growing and producing in the ground here. The above picture does show that there is hope but the jury is still out as to whether this tree will at some point produce delicious fruit. The main problems with growing avocados in Phoenix is that they don't like the summer heat or the salty soil and water. Winter cold does not seem to be a problem with the more hardy varieties. Young avocado trees definitely need afternoon shade in the lower Sonoran Desert and should be shielded from the sun with shade cloth in June, July, and August. Being on the east side of a deciduous tree is an ideal spot because the tree will get the protection it needs in the summer, but will get full sun in the winter. As for heat tolerance by variety, I have found that Haas avocado trees cannot take the summer heat here no matter how much shade they get while other varieties fare better. The more cold tolerant Mexican avocado varieties are able to take temperatures as low as citrus trees can. So, there is not much reason to be concerned about them in developed areas of town. My Zutano tree survived temperatures as low as 26 F. without a single damaged leaf, while many of the ficus trees in the neighborhood were killed. I have not seen no evidence of frost damage on my Winter Mexican avocado tree and it has been in the ground two full winters with no protection. The biggest challenge for growing an avocado tree here is the salinity of the soil and water. Basin irrigation is the most effective watering method for pushing salt away from the trees root ball. Avocado trees do well on a grass watering schedule. An occasional deep soak is beneficial if the trees leaves are showing signs of salt burn. Deep soaking is done by turning the hose on very low and letting it run at the base of the tree for several hours. Deep soaking will help to wash salt to the edges of the area of soaked soil. After deep soaking, one can often see a visible ring of salt. Avocados are very salt sensitive, so it is safest not to use any chemical or organic fertilizers on them. Maintaining a light layer of compost around the trees base is the safest way to supply it with extra nutrients. Avocados have no significant pest problems in Arizona.